A traveling retrospective of George Bellows offers a fresh perspective on an artist whose work transcended time, place, and the accomplishments of his contemporaries. To say that George Bellows was quintessentially American is to state nothing less than the outstanding fact about the man. Though he moved in 1904 to New York City-then as now the artistic capital of America-and though he spent most of his career there, he was born in Columbus, Ohio, and he has always been associated as much with that city of the heartland as he is with NewYork. Bellows is also the only American artist of any importance ever to play semiprofessional baseball (with the Brooklyn Howards), an activity in which he excelled and that suited his strapping frame. Two Women by Bellows, 1924. Oil on canvas, 59 by 65 inches. Collection of Karl Jaeger, chairman, Our Future Planet, Tamara Jaeger, and Karena Jaeger. Both Members of This Club by Bellows, 1909. Signed “Geo Bellows” at lower right. Oil on canvas, 45 ¼ by 63 ¼ inches. National Gallery of Art, Chester Dale Collection. Paddy Flannigan by Bellows, 1908. Oil on canvas, 30 ¼ by 25 inches. Collection of Erving and Joyce Wolf. But in acknowledging his Americanness, one is struck by how much that fails to explain about the paintings, drawings, and engravings that he generated with almost tornadic force over the twenty years of his career and that are now the subject of a full-dress retrospective at the National Gallery of Art in Washington (June 10 to October 8). William Blake’s famous adage, that “genius is always above its age,” could be extended to the place in which it occurs: precisely because Bellows was so American, his ultimate transcendence of that fact is, or should be, striking. Surely it is easy to see why Bellows has been viewed as the American painter par excellence. In his images of boys diving into the East River and boxers at the Polo Grounds, in scenes of Times Square on election night and Penn Station in the initial phases of its excavation, he has revealed to us the great and omnifarious American nation stirring itself awake at the dawn of the century it would come to dominate. What seems most conspicuous in these works is their combination of utterly fresh perception and exemplary power. Bellows’s masterful New York from 1911 (Fig. 2) could almost serve as an illustration to John Dos Passos’s classic novel Manhattan Transfer. An étude in bluish grays and browns, with unanticipated flashes of pink, gold, and green, this wintry cityscape is crammed with life, as a cast of thousands files across the foreground and the great, nascent skyline rises up in the rear. Its composition recalls the slightly earlier masterpieces of Maurice Prendergast, but all the lingering perfume of the Gilded Age has faded away and we run headlong into modern times. Henry James famously referred to the world that Bellows painted, at the moment when he began painting it, as the American Scene. Bellows was far from the only artist who aspired to capture the realities of his native land. Robert Henri, his esteemed teacher, had enjoined an entire generation to take up this task. And many did: William Glackens, Walt Kuhn, Guy Pène du Bois, and others rose to the summons and achieved some notable results. But in most cases those results were more noteworthy for the novelty of their aspirations-the depiction of modern American life-than for their pure artistic achievement, at least by European standards. Only with Bellows at his best is that not the case. Only Bellows was equal to any continental artist in his complete mastery of his medium, as well as in his possessing that indefinable touch of the poet that enabled him to see not only the socio-political relevance, but also the transcendent loveliness (inBlue Morning) of smoke rising as an amethystine plume from a construction site presided over by a crew of faceless, yet all too human workers (Fig. 1). Though Bellows’s artistic mission was assigned to him by Henri, it ultimately derives from Baudelaire’s injunction that painters record the modern world and the tumultuous scenes that surround them. Bellows could almost have been quoting the Frenchman in his claim that the artist “must be a spectator of life, a reverential, enthusiastic, emotional spectator.”4 At the same time, there would seem to be something equally American-at least in early twentieth-century terms-in Bellows’s resistance to theory for its own sake, as well as in a certain cultural conservatism that revealed itself when confronted by some of the more aggressive developments in Europe. “The Cubists,” he wrote, “are merely laying bare a principle of construction which is contained within the great works of art which have gone before.”5 He similarly had no use for Marcel Duchamp, who participated with him in the great Armory Show of 1913. Bellows followed the promptings of Paris up to the point of post-impressionism and no further. It is as though, having found in that movement the perfect balance of art and truth, he felt no need to look any further. That is to say, his art, especially in the decade after his arrival in New York, took a boldly improvisational approach to reality, somewhere between the optic fidelity of the impressionists and the dreaminess of the symbolists and post-impressionists. And it is no small testament to Bellows’s achievement that, although he had seen precious little work by his European contemporaries, he seems instantly, intuitively to have grasped its most essential formal and thematic achievements. But the masterpieces that resulted were fundamentally different from what a European would have produced. Consider the exquisite Morning Snow-Hudson River of 1910 (Fig. 5). It is a triumph of observation, dominated by the bright earth tones of the bare trees and three human figures and by the mottled whiteness of the snow that spans out all the way to the frozen Hudson in the background. One cannot help but admire all that Bellows has seen in the stuttered rhythms of the fences in the middle ground, or the coarse textures of the exposed bark, or the father and child who pass a man driving his spade into the frozen earth. A European post-impressionist school would have sacrificed much of the reality in the name of poetic sentiment, while most of Bellows’s American contemporaries would have foregone poetry and reality together in the name of social commentary. In part the National Gallery’s exhibition is revisionist, challenging the general view that Bellows’s best work was from the first fifteen or so years of the twentieth century, that his subsequent paintings, though good, lacked the exalted genius of those earlier works. This thesis, I believe, is more easily defended from an historical perspective than from a critical one. In the great canvases that predate and coincide with the Armory Show, you find an almost electric connection between the artist and his subjects that is less evident in his later works. It is as though Bellows were able, in a single glance, to grasp the formal and thematic demands of any given subject, as though he had from birth all the skills needed to transfer his visions to the canvas. This is abundantly true of the landscapes and cityscapes that I have already described, but it is no less true of his early and deeply touching portrait of the bare-chested Paddy Flannigan (Fig. 3), a homeless youth (or so it would seem) whose pale skin flashes, as though illuminated by lightning, against a dark ground. In Bellows’s later works, however, that intuitive spontaneity gives way to a more studied approach both to the application of paint and to the building of the composition. Only compare his early image of boxers, Both Members of This Club from 1909 (Fig. 6), with one of his later works, Dempsey and Firpo (Fig. 7). In the earlier work, there is an almost slippery gleam to the pigment that constitutes this scene of raw and unmediated violence. In the later work, however, the figures are more stylized, the composition more static, and the paint textures far flatter. These qualities become increasingly evident in Bellows’s portraits of this period. 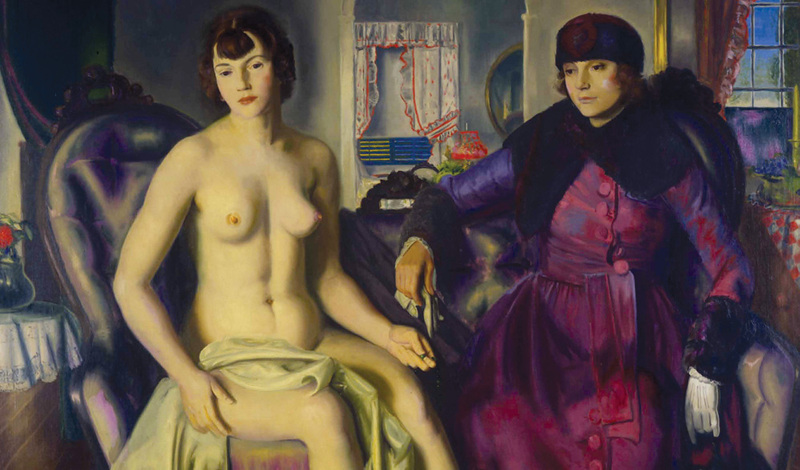 The static balance of the impassive seated figures, one naked, the other clothed, in Two Women (Fig. 4), could hardly be more different in mood and execution from the depiction of Paddy Flannigan. Although in theory there is no reason to prefer spontaneity to classicism or classicism to spontaneity, Bellows’s works of the 1920s, though not without their charms, are more stylized and conventional, and feel like something of a falling off when measured against the epiphanies of his earlier masterpieces. Though it would hardly be fair to say that Bellows is unsung, the new exhibition in Washington should make clear that he deserves far more of the world’s attention than he has thus far received. He is as eminent a painter as Edward Hopper and he exhibits, I believe, a greater mastery of his materials, even though he has never won the iconic prestige that surrounds Hopper. In one of the ironies of art history, Bellows was almost immediately greeted as the leading American artist of his generation, whereas Hopper, though born in the same year, began to win fame only after Bellows died. Of all the American painters who lived and worked in America before World War II, only Hopper is immediately recognized abroad. Bellows deserves such renown as well, and it is with that in mind that the Washington exhibition, after a visit to New York’s Metropolitan Museum, will continue on to London’s Royal Academy of Arts. p. 20. 2 Ibid. 3 Ibid., p. 190. 4 Ibid., p. 9. 5 Ibid., p. 17.